Everything you ever wanted to know about roofing – and probably a few things you don’t. Here at RCABC we’ve worked hard over the past 50 plus years to become the definitive source for professionals within the roofing industry. However, we’re also here for consumers looking to educate themselves on what goes into proper roofing design, installation and repair. With that in mind, we’ve compiled a guide that provides some of this background information as well as useful advice on how to select a roofing services provider here in BC. 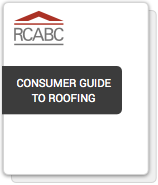 This guide includes information reprinted from the RCABC Roofing Practices Manual and other publications including those used by the RCABC Education & Training department during the training of roofing and architectural sheet metal apprentices and journey persons for the province of BC.